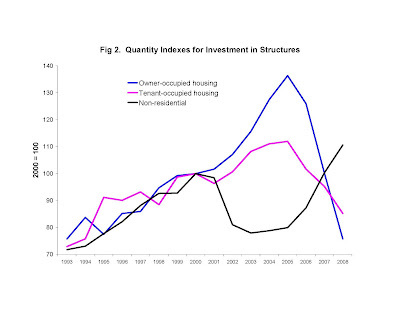 Below are BEA's indices of real investment in structures, for three types: owner-occupied housing, tenant-occupied housing, and non-residential structures (the BEA has the first two indices only on an annual basis, and so far only through 2008). I have recently softened my view that the Federal Reserve gets little blame/credit for the housing boom. But shouldn't low interest rates make a building boom for all three types of structures? What did the Federal Reserve do to create a bias against non-residential building? Added: Milton Recht (thank you!) pointed me to these three graphs. 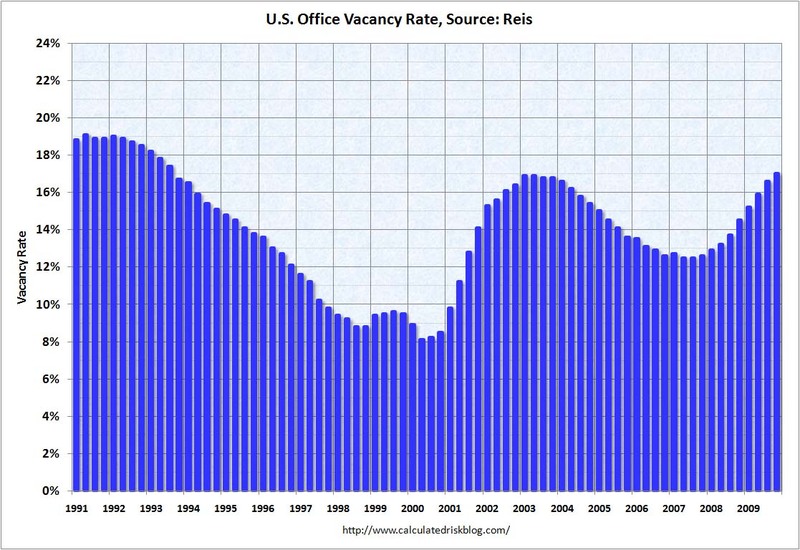 By one of the measures, non-residential vacancy rates were high during the housing boom. Is that a coincidence? In theory, low non-res construction activity could encourage housing construction, but it would do so by lowering housing prices rather than increasing them. Moreover, it seems that the purchase price of non-residential real estate was high (despite the perhaps high vacancy rates). Government policy continues to rigidly classify mortgages by their “affordability,” and pays too little attention to strategic defaults. Policy mistakes like these serve to prolong the foreclosure crisis. The home foreclosure process begins when a homeowner stops making his mortgage payments, so the major policy question is how to get homeowners to pay. One school of thought is that mortgage payments are too high to be “affordable,” and if the government could arrange for payments that were a more reasonable fraction of the borrower’s income, homeowners would make their payments and keep their homes. As I explained last week, this idea is the cornerstone of federal mortgage modification programs, under both the Bush and the Obama administrations. The other school of thought is that “affordability” cannot be so rigidly defined, and that the vast majority of homeowners — even many of the unemployed — would make their mortgage payments if they had enough incentives to do so. In this view, most foreclosures are cases of “strategic default”: homeowners who determined that it is worth a move, and a reduced credit rating, to erase their negative home equity and relieve the stress associated with sizable housing payments. One of the criticisms in last week’s report by the Troubled Asset Relief Program’s inspector general is that federal mortgage modification programs do not reduce the principal balance of underwater mortgages, and thereby fail to address strategic defaults. The report also pointed out that a large number of homeowners who had their mortgage payments reduced to levels that the government deemed “affordable” still defaulted. This is further evidence that the government policy will not significantly impact the foreclosure crisis by focusing on “affordability,” yet affordability is the centerpiece of the Obama administration’s new set of policy initiatives to keep unemployed workers in their homes. As shown by a 1999 study by Martha Olney, a professor at the University of California, Berkeley, the Great Depression of the 1930s offers vivid evidence that borrowers default for strategic reasons, and make full payments even on loans that appear “unaffordable” when given the incentive to do so. (Thanks to Song Han at the Federal Reserve Board for pointing me to this study). During the 1920s boom that preceded the Great Depression, consumer indebtedness grew twice as much as household incomes, which themselves grew significantly. From 1929 to 1933, employment and household income fell many times more than they have fallen in the current recession: If there ever was a time when households could not afford to pay their debts, the Great Depression was such a time. Indeed, real estate mortgage defaults were common in the Great Depression, and both affordability and strategic default might be cited as reasons. But Professor Olney showed that the incentives for strategic default varied across loan types during the Great Depression, and that default on consumer installment loans made little sense from a strategic point of view. In the 1920s, it was common for families to purchase automobiles, refrigerators, stoves, and other consumer durables with “installment debt”: that is, they made a down payment of about one-third, took the item home immediately, and promised to make regular payments until the item was fully paid. If the borrower failed to make his payments — even the last one — the item he purchased could be repossessed and he would receive no refund of his prior payments. In other words, absent the destruction of the item purchased, it was impossible to be “underwater” on the typical installment debt contract of those days, and thus there was no incentive to strategically default. Professor Olney found that defaults on such contracts were rare in the early 1930s: “Despite the layoffs, the wage cuts, and the unprecedented prevalence of installment credit use, families with installment debt were avoiding default” (pp. 321-2). Later in the Great Depression, the rules for repossessing consumer durables changed, and consumers had to be given a refund of part of the payments they made prior to default. The incentive to repay installment debt fell, and Professor Olney found delinquencies and defaults on installment debt to rise. Many people who lost their jobs in the 1930s still made their debt payments, as long as they had an incentive to do so. Today homeowners with negative equity have little financial incentive to make their payments. By focusing so much on “affordability,” the Obama adminstration’s latest policies do little to prevent strategic default, and should not be expected to alleviate the foreclosure crisis. 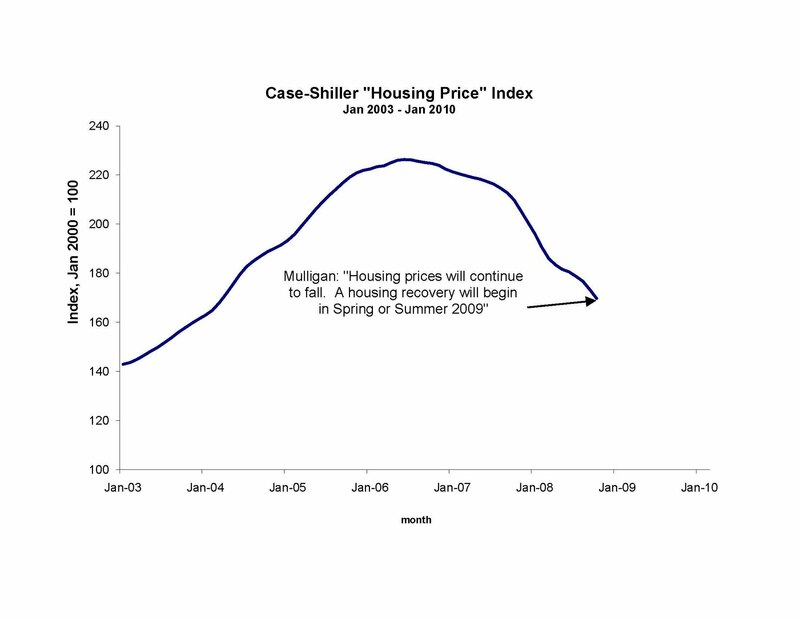 At the end of 2008, with housing data through Oct 2008 in hand, I predicted that housing prices would continue to fall, but begin to recover in the Summer of 2009 and perhaps as early as Spring (I also gave a precise definition of "recovery"). With at least 6 months more data in hand, and housing prices still seeming to fall sharply, Professor Shiller wrote in the New York Times that the housing price "decline might well continue for a long time" -- apparently disagreeing with me that a housing recovery was beginning. I use this one, but I ran across this one today. In case you were wondering how legendary economist Gary Becker is doing, or where our economy is headed, take a look at yesterday's Wall Street Journal. Almost a year and a half ago, I wrote "A Depressing Scenario: Mortgage Debt Becomes Unemployment Insurance" about how unemployment could, in theory, become a ticket to free housing. 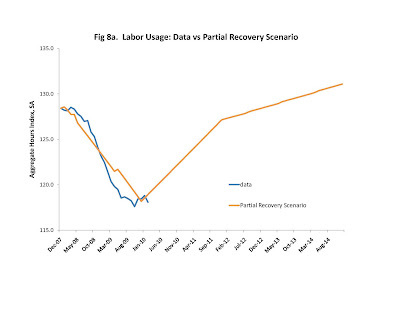 This week the Obama Administration made that scenario come true (Treasury link). Does It Matter Whether Unemployment is Socially Productive? Evidence that unemployment insurance causes more unemployment is easy to find. So a few stimulus law advocates (recall that actual and prospective stimulus laws spend significant $ on unemployment insurance programs) have embraced that evidence, claiming that workers can gain something by being unemployed longer, because they can search for a better job. Suppose for a moment that their claim -- unemployment time is socially productive -- is correct. Still, the claim does not rationalize unemployment insurance. Actually working is productive too, that's why people get paid for doing it. And it's widely recognized that the observed behavioral reactions occur because unemployment insurance subsidizes unemployment relative to working. Efficiency is lost whenever one productive activity is subsidized relative to another. In other words, the argument that unemployment insurance is inefficient in no way relies on an assumption that unemployment is entirely wasteful. The marketplace involves a myriad of decisions between alternate productive activities, and the case for subsidies happens only when the market by itself would excessively favor one over the other. So if you want to defend unemployment insurance on the grounds that unemployment is productive, you need to further argue that the market by itself results in too little unemployment, so that unemployment insurance helps ensure that we get the extra unemployment that society needs! Such a claim would be logical, and perhaps even correct, but I predict that stimulus law advocates are unwilling to make it. We are starting to get some micro data from the recession, and it will be interesting to see how various types of workers and employers behaved. Macroblog reports that new firms have been doing proportionately more hiring. Comparing new and old firms is a good way to see whether its (lack of) new loans that is holding back business growth or some kind of problem with old loans. New businesses are not burdened by old loans, but they do benefit from new loans. I have seen some commentary that the higher income people have fared better in the recession. I'm not sure that's true, but if so, that is consistent with the view that various means-tested benefits are reducing labor supply because the highest income people are unaffected by means-tested benefits. SIGTARP is critical of the Treasury's program, but apparently does not think much about economics. Has anyone seen time series data on automobile accident claims? Many auto insurance contracts have a specified value (e.g., blue book value) for auto accident awards, and that specified value may not immediately adjust to market conditions. Thus, IF it were true that used car prices fell during the recession, this would reduce the cost to an insured driver of having an accident that "totaled" his auto, which could increase the frequency of accidents that resulted in totaled cars. Suppose, for example, your car is insured for $5k. Before the recession, a total accident would cost you $1k plus medical bills and hassle because purchasing a similar car would cost you $6k minus the $5k insurance award. During the recession, you could replace your car for $4.5k, so a total accident during the recession would give you a profit of $500, minus medical bills and hassle. So the recession made accidents cheaper (but not necessarily free). This does not even count the fact that you might not be working during the recession, and have less of a need for your car, or might like to replace your car with one cheaper to operate. One may also want to adjust for the fact that less driving occurs during recessions: the question is whether the driving-adjusted accident rate is higher during a recession. I have not seen any data on this, but it's something interesting for an economist to investigate. Which Matters: A Program's Name or Its Actual Consequences? Milton Friedman poses the question in this video posted here. The "Stimulus" Law of 2009 is a huge example of a public program with consequences opposite of its name. “In Sweden, the centre-right government elected in 2006 has implemented significant income tax reductions (and payroll tax reductions), particularly for low earners while at the same time, unemployment and sick leave benefits have been cut and it has become much more difficult to be able to receive such benefits. Denmark’s employment has fallen 5% in the past year while Sweden’s is unchanged. CBM: I am embarrassed to report having been too busy in this recession to give much attention to the details of European recessions, but I did make one comparison of European countries that included Sweden (with a 2 percent employment gain over 7 quarters) but did not include Denmark due to lack of GDP data. 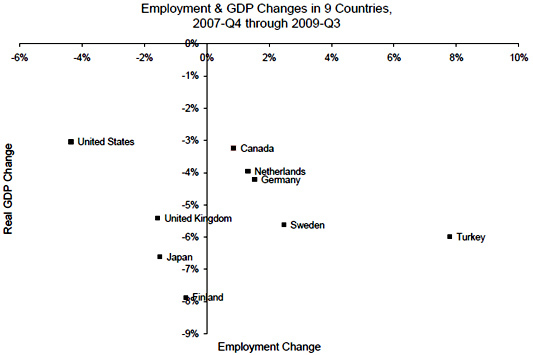 The same employment data show a -0.6 percent employment loss for Denmark. However, the theme of my article was that countries that allowed employment to adjust downward may, remarkably, enjoy MORE GDP as a result. Determining whether my article's suggestion is correct, and whether that logic has much to say about the Denmark-Sweden comparison, requires further research. Means-tested government benefits, and the “resentment zone” that goes with them, are more prevalent than ever, thanks to the housing crash. Programs like these delay the housing market’s recovery. 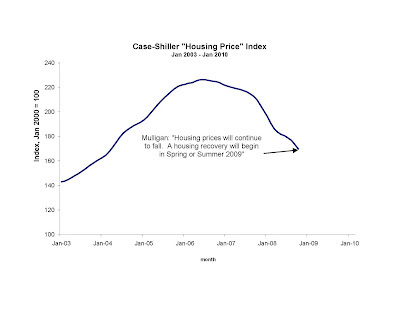 However, housing prices have fallen dramatically since 2006. By 2009, about one in four home mortgages was “underwater” — meaning that the market value of the house had fallen below the amount owed on the mortgage (a.k.a., home equity is negative). Because of the low resale values, foreclosing on any of the homes will not yield lenders their entire principal; lenders in those cases must rely on the good behavior of the borrowers. Meanwhile, homeowners are considering whether it is worth moving, and a reduced credit rating, in order to erase their negative home equity by walking away from their home and its mortgage. As it has with health care, student loans, nutrition and other areas, the federal government has responded to the mortgage crisis with another layer of means-tested benefits. And these may be the largest means tests yet. The government’s idea was to “modify” underwater mortgages in order to give homeowners an additional incentive to stay in their house. But the government will not sponsor such modifications for people with negative home equity who also earn “enough” to make their mortgage payments. The government programs aim to modify the mortgage so that the modified mortgage payments, together with taxes and insurance, are 31 percent of the borrower’s income. Those reduced payments remain in place for five years, if not longer. Thus, a homeowner earning $60,000 per year would have his annual housing expenses reduced to $18,600 (31 percent of his income), whereas one earning $70,000 would have expenses of $21,700. In other words, the fact that one person earns an additional $10,000 for the year obligates him to $15,500 additional housing expenses (an additional $3,100 per year for five years). For this reason, mortgage modification has dramatically larger penalties for earning than other means-tested government programs. This not only adds to an already large pool of resentment, but is also partly responsible for the slow pace of modification by mortgage lenders and servicers, and for the dearth of income tax revenues collected by state and federal treasuries. "1. While both parties included income tax, EITC, and child tax credits, we also included social security and Medicare taxes. Because we included both the employer and employee side of those taxes, we also included the employer share as income when figuring out the overall tax rates. This is the same method the JCT employed, and they explain it a bit better than I just did in footnote 1 of http://www.hudson.org/files/documents/Response_to_Mark_Prater_Effective_Marginal_Tax_Rates.pdf. 2. We included the loss of the bill's cost-sharing tax credits, which Holtz-Eakin and Brill did not. The cost-sharing tax credits are outlined on pp. 261-262 of http://democrats.senate.gov/reform/patient-protection-affordable-care-act-as-passed.pdf, but essentially, families at 150% and below of the FPL get insurance with a 90% actuarial value, families with incomes between 150 and 200% FPL get insurance with 80% actuarial value, and families above that get no special treatment. 3. We also assumed that people would purchase a 60% AV plan (called a bronze plan in the bill) rather than the subsidized 70% AV silver plan if it were cheaper for them to do so. I'm not certain if they chose to consider that or not, but it's not in their graph. (This accounts for the final spike in our charts). Depending on how expensive you predict insurance will be, families might not necessarily face this choice if they hit 400% FPL--the phase out of all subsidies--before their mandate tax rate exceeds the cost of a bronze plan. When that happens, there is an even steeper cliff at 400% FPL." It will take me a while to digest what all this means, but in the meantime readers of this blog may want to pursue this further -- I hope the above information helps. Yesterday I updated my list of employment-reducing policies that are new or significantly expanded during this recession. Policies like these have their largest effect when work incentives would be dull even without them. Thus, this widely cited chart (reproduced below) is especially interesting, because it includes only programs that pre-dated the recession (social security and income taxes, EITC, food stamps, Medicaid, Section 8 Housing, and TANF). So redrawing this picture to include the items on my list would show an even wider "dead zone", and economics tells us that the widening would have an especially large aggregate effect (as compared to a situation where there was no pre-recession dead zone). The chart below displays estimates of marginal tax rates for various income groups, under three laws (the chart was made in January, so "current law" meant neither House nor Senate bill). This chart comes from a Cato Institute study, and was displayed on the Kaiser Foundation's web site. An important part of my interpretation and forecasting of the macroeconomy was the assumption that higher marginal tax rates were here for the long term -- I have to thank lawmakers for making my forecasts come true! Milton Friedman's Optimum Quantity of Money rule said that government liabilities (of which "money" is one example) should by supplied in large enough quantity that they earn the same return as private sector liabilities. Today it was reported that now U.S. Treasuries yield about the same as some high grade corporate debt, after decades of yielding significantly less. Berkshire Hathaway debt actually yields less (but see the comment below that Bloomberg made a mistake)! Unfortunately, Milton Friedman and economists since him do not have an empirically accurate theory of why private sector securities have such different expected returns, so it's not clear which of the many private returns would be the same as the Treasury yield in a world with the optimum quantity of government liabilities. Is the average private return? Or the returns on private securities with similar "risk" as Treasuries? The answer depends on what is your theory of why private assets can have different returns, but arguably we have now reach the optimum quantity of government liabilities. UPDATE: Econbrowser claims that raising the unemployment rate might enhance welfare -- for a more detailed discussion of that remarkable claim, see this short post. Although a bunch of economists proclaim that UI's general equilibrium effect offsets its partial equilibrium effect, they have put forward zero evidence in support. Do Jobless Benefits Discourage People From Taking Jobs During a Recession? Unemployment benefits provide a small amount of help to a number of people who desperately need it. But some economists have gone too far by claiming that unemployment insurance is stimulating the economy. Unemployment insurance is jointly administered and financed by the federal and state governments, offering funds to “covered” people who lost their jobs and have as yet been unable to find and start a new job. The program has been around for decades, but this recession has created an especially large group of laid-off workers who, despite an extensive search, genuinely cannot find another job. With no new job in sight, a large group of people are under considerable personal and financial stress. In recognition of these facts, the “stimulus” law of 2009 extended the eligibility period for unemployment benefits, and provided additional funds for the program. Fewer people working means a lower employment rate, and less output because unemployed people are not yet contributing to production. The recession has seen a number of economists ignore prior findings on unemployment insurance, at least as long as this recession continues. For example, in evaluating the stimulus law economists at the nonpartisan Congressional Budget Office assumed that the law would raise gross domestic product, and took no account of the fact that the unemployment insurance and other provisions of the stimulus law give people incentives to work less. I have not seen any evidence to support this claim that, in essence, the laws of economics are suspended as long as a recession continues. Rather, the available evidence suggests the opposite. One feature of the unemployment insurance program is that it specifies an exhaustion date: a person stops receiving benefits when he or she starts working again, or reaches the exhaustion date (often a fixed number of weeks after being laid off), whichever comes first. In the past, economists observed that a large fraction of unemployed people suddenly started working again within a week or so of their exhaustion date, despite having been without work for so many weeks prior: evidence that the benefits themselves were sustaining unemployment. If the Congressional Budget Office, Professor Krugman and others were correct, this pattern would be absent during a recession, because the demand just isn’t there, and demand will not miraculously appear merely because of the arrival of the benefit exhaustion date. 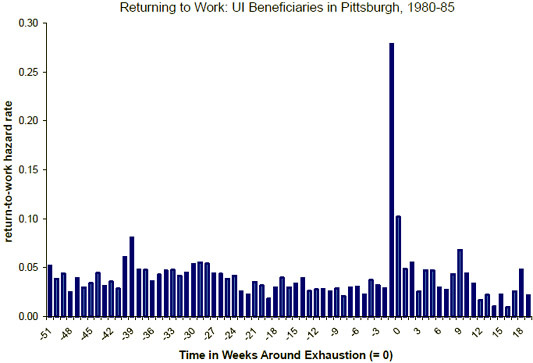 A study published by two labor economists, Štepan Jurajda and Frederick J. Tannery, looked at employment histories for unemployment insurance recipients in Pittsburgh in the early 1980s. Unemployment rates got quite high in Pittsburgh in those days, reaching 16 percent at one point, and staying over 10 percent for two and a half years. “Demand” may have been lacking in Pittsburgh in the early 1980s, but that did not stop unemployed people from responding to the work incentives presented to them by the unemployment insurance program (economists also looked for this pattern during a Swedish recession, and found it there too). Unemployment insurance is only a small part of the reason why the labor market has so far failed to restore employment to pre-recession levels. But unemployment insurance is not free: It results in less employment and less output, not more. The real question is whether, and for how long, this price is worth paying to continue a just and compassionate program. I'm not sure how much this matters, but U.S. houses during the boom did not look so expensive from a European perspective. To make the chart below, I took the Case-Shiller composite 20 and made two conversions: one to US-inflation-adjusted US dollars (that is, divide the Case-Shiller by the PCE deflator) and the second to Euro-inflation-adjusted Europs (that is, multiply the Case-Shiller by Euro exchange rate and then divide by the EURO HICP -- the consumer price index for the Euro area). added: here's a Canadian (inflation-unadjusted?) perspective. I have emphasized that an asset price collapse can reduce labor usage because those assets serve as loan collateral, and when the collateral values fall lenders are induced to "discriminate" in their loan collection: namely to collect primarily from businesses and households that are successful, and effectively forgive those who are not. This acts an an implicit tax on success, and causes business and households to have less revenue and income than they would otherwise. Another possible link is that business asset values determine corporate tax liabilities. When assets values fall, the IRS effectively owns the asset at the margin, and the corporation has no reason to nurture it. I read an example of this in AOL's business (HT: Professor Perry): it looks like some workers at Bebo can expect to be fired solely because of the corporate tax code. The elasticity of housing supply is the effect on the flow of home building (measured as a log change -- think of it as a percentage change) of the inflation-adjusted purchase price of housing (also measured as a log change). The elasticity has long been studied in economics; one of the seminal studies was published by Professors Topel and Rosen in 1988. 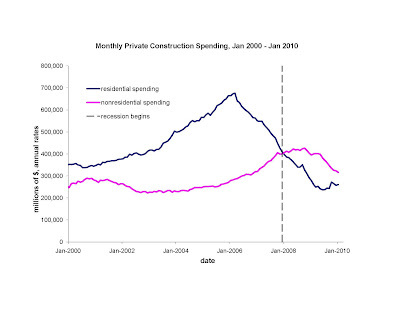 The most recent (2000-2005) housing boom was a boom in both housing prices and construction -- was it a movement (albeit, further) along the same sort of supply curve as in previous housing cycles? Unfortunately, I have noted before that various housing price indices disagree widely about the magnitude of the housing price boom. The Case-Shiller index (adjusted for general inflation as measured by the PCE deflator), says that housing prices were 0.56 log points (about 75%) .17higher in 2005 than they were in 2000. The OFHEO index says 0.27 log points. The Census Bureau quality-adjusted index of the selling prices of new homes (the index used in the Topel-Rosen study) says 0.17 log points. 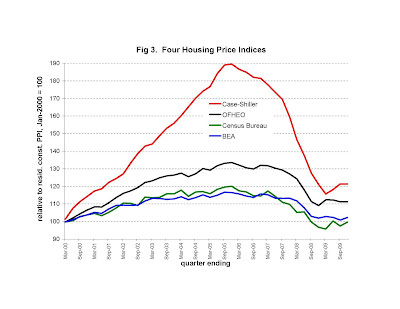 The BEA price index for new residential structures says 0.15 log points. Because the indices give such different estimates of housing price changes, they would give equally different estimates of the supply elasticity. So, in order to answer the question, it is crucial that I stick with the index used by Topel and Rosen. Real residential investment per capita increased 0.24 log points. So that implies a supply elasticity of 1.4 for the period 2000-2005. 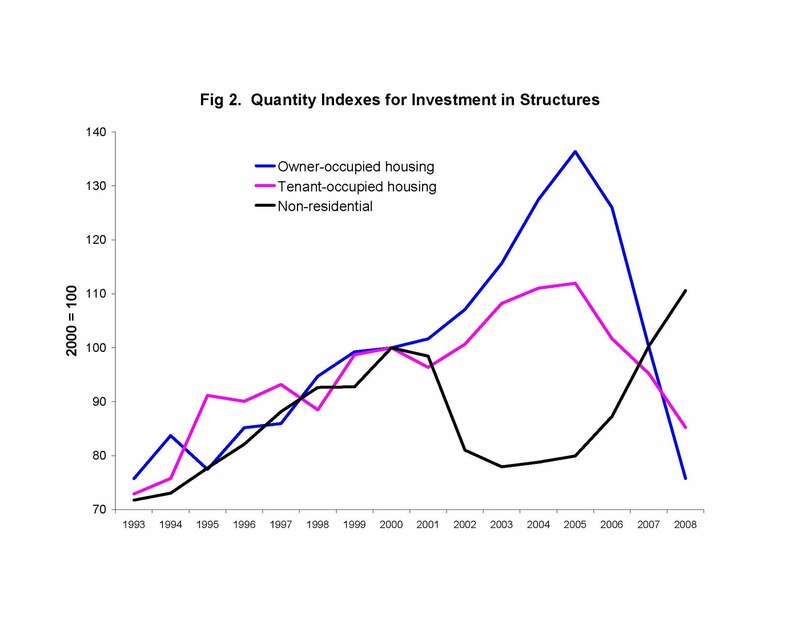 Topel and Rosen found significant lags in the response of investment to housing prices, whereas the boom and bust since 2000 interestingly show housing construction and housing prices to change direction in essentially the same month. Putting that aside, Topel and Rosen find a 1.0 supply elasticity with respect to a housing price elevation that lasts one year, a 1.6 elasticity for a 4-year elevation, and a 1.7 elasticity for a 8-year elevation. So that looks pretty close to what happened in the recent boom, occurring after Topel and Rosen wrote. How Much has the Government Subsidized the Mortgage Market? government purchases of mortgages, pieces of mortgages, and liabilities of funds and institutions that own mortgages or pieces of mortgages, in excess of their market value. It's the excess over market value that counts as a subsidy. For example, most of the $100+ billion the government paid to AIG was a subsidy, because what it got in return was essentially worthless (from the market's point of view). The $700 billion TARP would not be all subsidy, but the Treasury received some positive value assets in return. On the other hand, I would say that Goldman Sachs received a TARP subsidy, even though it eventually paid the money back with interest, because the government paid more than market price for its Goldman Sachs securities (e.g., in another state of the world, Goldman Sachs never pays back). the increase in the net worth of the owners of mortgages due to the fact that mortgage lenders are permitted to discriminate in their modifications on the basis of borrower tax returns (thereby depleting federal, state, and local Treasuries of income tax revenues). These amounts are $3-8 trillion. However, much of that is not a subsidy (see above), and these total entirely exclude the implicit subsidy occurring through mortgage modification. Luke Threinen and I calculated that the U.S. housing market crashed a total of $5 - 8 trillion (difficult to know exactly, because housing price indices disagree so much on the amount of the price reduction). So it's easy to see that government paid for 25% of that loss, and conceivably paid for 50% or more. Commenters: have you seen any studies of the amount of mortgage market subsidies? Houses are valuable because people like to live in them, or at least (as with many second homes) know that space is available for them to live in. The fundamental value-added of a house over, say a year's time frame, therefore depends on the how effectively a particular structure satisfies that demand, as compared to alternative structures that existed that year. There are two fundamental, yet universally ignored, reasons why the purchase price of a house might vary MORE than the flow of value-added. First, it is rare that a structure by itself can provide living space to the highest value occupant -- other resources are also needed to accomplish this. Namely, real estate agents and mortgage bankers are usually needed to match an particular structure with a person or family who has a high valuation of its living space. Real estate agents and mortgage bankers share the value-added with the owner of the structure; in this view the purchase price of the house is the present value of the value-added MINUS what it costs to have real estate agents and mortgage bankers participate. Moreover, real estate agents and mortgage bankers are much more elastically supplied in the short run than are housing structures, so an increase in the current or expected future value-added causes a less than proportionate increase in the resources spent per house on real estate agents and mortgage bankers, but (depending on the time frame over which housing structures are also elastically supplied) potentially a greater than proportionate increase in a house's purchase price. The second source of leverage is government subsidies to the mortgage market. Through its implicit and explicit guarantees of mortgages and the banks who own them, the government injects taxpayer funds into the mortgage market when housing prices fall, but does not receive funds from the market when housing prices rise. Mortgage banking is a competitive industry, so the supply of mortgage banking shifts down when this expected subsidy is large. In particular, when high value-added (either in the present or expected in the future) temporarily raises housing prices, the expected subsidy increases (temporarily high prices = prices will fall in the future) and the supply of mortgage bankers shifts down. In this way, an increase in the demand for housing structures automatically increases the supply of resources that complement housing structures, and thereby leverage the initial demand increase. Obviously, if you ignore these sources of leverage, you will misattribute some of the historical housing price boom to "irrationality." 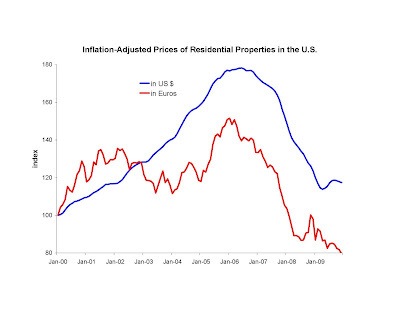 Perhaps more important, you will be surprised when the same fundamentals increase housing prices again. Did the Minimum Wage Increase Destroy Jobs? As I’ve discussed before, national trends suggest that the sharp fall in part-time work during the last five months of 2009 can be largely attributed to last summer’s federal minimum-wage increase. A look at job changes in individual states seems to confirm this conclusion. Two months ago, I noted how national, seasonally adjusted part-time employment increased almost 2.5 million during this recession, but then it peaked in July 2009 and headed sharply downward. I thought that it was no coincidence that the federal minimum hourly wage was raised, on July 24, 2009, from $6.55 to $7.25 — especially since the inflation-adjusted federal minimum wage had already gotten pretty high. I estimated that part-time employment would have been about 500,000 greater in the last couple of months of the year if it hadn’t been for that last increase in the federal minimum. Many of us view 500,000 job losses as a lot because they would, for example, make a sizable dent in the jobs that the White House claimed last year that it would create with its $787 billion stimulus law. Some of the readers of this blog, as well as the Economic Policy Institute, wondered whether my conclusion about the federal minimum could be confirmed with regional data. After all, 19 states were not directly affected by the July 2009 federal increase because they already had their minimum wage at least at $7.25 per hour (the federal minimum prevails over the state minimum whenever the former is greater). Thus, whatever jobs were lost because of the federal increase would be lost in the other 31 states and the District of Columbia (which sets its minimum to be $1 above the federal minimum, so when the federal minimum jumps, do does D.C.’s). Testing the state-level hypothesis with the Census Bureau’s household survey is not so easy because 500,000 job losses, significant as they are, can easily be swamped by seasonal and statistical fluctuations in the state-level household surveys. Another problem is that high-minimum-wage states have different labor markets than the others. With these cautionary notes, consider the chart below. It shows how the ratio of part-time workers to full-time workers has changed since its level in July 2009 (the last month that the federal minimum wage of $6.55 was in effect). For example, a value of “0.02” for December means that the ratio of part-time workers to full-time workers in a group of states in December was 2 percent greater than it was in July. (If you’re curious: Nationwide, there is one part-time worker for every four or five full-time workers). The ratio increased in both the “unaffected” states (blue series) and the affected states (solid red series). As we know from the national seasonally adjusted data, the ratio did not increase nationally, so seasonality tended to increase both series. My claim is not that the federal increase would halt seasonality, but merely that it would put the ratio lower in the affected states than it would have been. 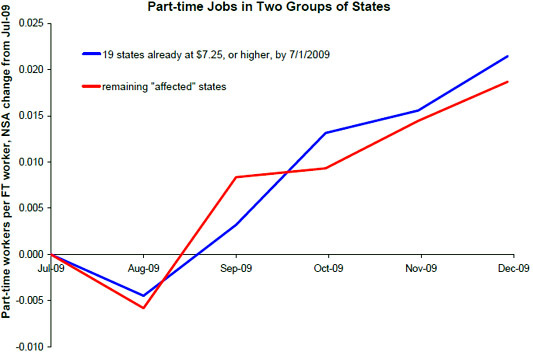 The red series for the affected states is below the blue series for the unaffected states four out of five months, which is consistent with the hypothesis that the federal increase caused part-time job losses in the affected states, but not in the others. With all of this recession’s significant labor market problems, and the expensive federal efforts to offset them, it’s too bad that the minimum-wage law added so many people to the list of those who today cannot find jobs. In 2008, I was of the opinion that easy monetary policy cannot explain much of the housing boom. When Professors Krugman and Delong came to agree with me, I immediately realized that I was likely wrong! "Suppose that annual real interest rates were going to be one percentage point (100 basis points) lower for a year. Then the cost of buying a house, holding it for a year, and then selling it would be essentially one percent less. The low one-year interest rate would not affect the selling price at the end of the year because, by assumption, the reduction lasted only for a year and the next buyer will be back to normal interest rates. So the source of benefit from the low rate is that the initial buyer reduces the carrying cost for a year." "If you believe that the Fed kept the fed funds rate 2% below its proper Taylor-rule value for 3 years, that has a 6% impact on the price of a long-duration asset like housing. Even with a lot of positive-feedback trading built in, that’s not enough to create a big bubble." It's true that short term mortgage rates were a bit lower than normal during some of the housing boom. But the "normal" short term mortgage rate would not be the proper benchmark if the housing market really was anticipating the kinds of technical change I was writing about. 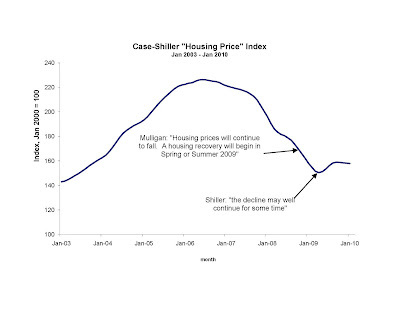 I explained how fundamentals -- the real prospects for technical change -- were temporarily pushing up housing prices. Even without subsidies, this process would efficiently raise the probability of a housing price crash, because nobody knew for sure when and how much technical progress would be realized. But mortgages include a put option: the homeowner can trade in his house keys for the lenders' erasing his payment obligation. And the housing boom I described above (or, for that matter, any process that caused housing prices to rise and increased the probability of a crash) was increasing the value of that put option. Absent subsidies, lenders would not be giving away such a valuable put option so cheaply -- they would have charged more than normal either in the form of higher mortgage rates, higher closing costs, or lower LTVs (when multiple transactions are packaged into one "mortgage", all of these might just show up in "higher mortgage rates"). So even if short term mortgage rates had been "normal", that would have been consistent with a large subsidy, because the unusual housing price dynamics called for extra mortgage charges to reflect the enhanced value of the put option typically included with mortgages. So anticipated government subsidies to the mortgage market magnified the housing price cycle. Prices would have gone up and come down even without them, but to a lesser magnitude. And the calculation I made in 2008, and Professors DeLong and Krugman reiterated in 2010, understates the housing price impact of those subsidies. I have recently returned to the topic of unemployment insurance (UI), showing how it does reduce employment, even during a recession. All of the UI extensions done by Bush and Obama have made national employment be less than it would have been (of course, lower employment may be a price worth paying to help people who lost their jobs). At the same time, I think that UI explains only a small part of the employment drop since 2007. If it were not such a great illustration of faulty economic reasoning, it would be low on my list of things to study about this recession. in order for a UI program to create a recession of this size, it would have to be very "well" (that is, destructively) targeted and would need a least a trillion dollars. Our UI system does not spend this much, and is not well-targeted. Professor Shimer has estimated that UI explains about one percentage point (maybe a bit more) of the almost 10 percentage point unemployment rate -- that leaves 9 points to be explained by something else. Much unemployment occurs among teenagers who are not eligible for UI. Nor can much of the recession be blamed on the minimum wage hikes, or even the combination of minimum wage hikes and UI. I think it is likely that employment would be millions higher if our government had abstained from the top dozen employment-reducing policies it has undertaken during this recession. But we economists have a long way to go to determine whether that policy combination destroyed 8 million jobs, or "just" 2 million (not to mention, some economists have a long way to go before they admit that government policy has destroyed any jobs). Last year I was told that "incentives do not matter" is a "straw man." -- that nobody actually believes this, so that my raising the issue was just rhetorical smoke and mirrors rather than a rebuttal of a real-live argument. "Everyone agrees that really generous unemployment benefits, by reducing the incentive to seek jobs, can raise the NAIRU ... But in case you haven’t noticed ... What’s limiting employment now is lack of demand for the things workers produce. Their incentives to seek work are, for now, irrelevant. [emphasis added]"
And it's not just one guy. One of the world's leading labor economists was quoted as saying "Traditionally, many economists have been leery of prolonged unemployment benefits because they can reduce the incentive to seek work. But that should not be a concern now because jobs remain so scarce," and mention of incentives like these was conspicuously absent from his testimony to Congress on what's going on in the labor market. (If you think it's just two guys, look here and here). (a) When a group of people is suddenly presented, during a recession, with different incentives to earn, that group suddenly changes its work and earning behavior. Last week I displayed a striking chart on unemployment duration in Pittsburgh during the early 1980s recession, when unemployment was higher than it is now, and stayed that way for years. Last summer I wrote about teenagers who are much more likely seek work when school lets out for summer. Tino pointed me to a paper about the Swedish unemployment system, which became less generous during a Swedish recession (I call it a recession because unemployment had surged and surpassed 9 percent). (b) Such groups do not merely switch places with other groups, but rather their behavior affects aggregate employment. I have shown how this worked in the summer of 2009, and for the first 12 months of this recession in the building industry. See also "The Laws of Economics have Been Suspended!" Textbook economic theory says that the minimum wage reduces employment according to (a) the gap between the minimum and the equilibrium wage and (b) the wage elasticity of labor demand. The nominal federal minimum wage was hiked again another 11 percent (from $6.55 to 7.25 per hour). Thus, by June 2009 the federal minimum probably already exceeded the equilibrium wage for a significant number of workers, especially those part time. For example, the BLS estimates that 2.3 million part-time workers were at or below the federal minimum in 2009 (BLS does not specify which month or months, but I presume March gets a lot of weight), as compared to 1.4 million a year earlier. So let's say that 2 million workers were affected by the 11 percent hike on July 24, 2009. With a labor demand elasticity of -3 (that's what Cobb-Douglas would predict), the textbook theory says that a half a million part-time workers would lose their jobs (or fail to be hired) due to the July 24, 2009 hike (525,177 = [1-(6.55/7.25)^3]*2,000,000). 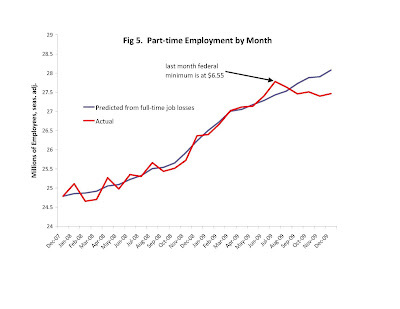 Interestingly, the national data do suggest that about 500,000 part-time jobs were lost. Without this perfect storm, the minimum wage would not be something of interest to macroeconomists, but "just" to observers of low-skill labor markets. Conversely, don't expect to see aggregate effects of the minimum wage unless the storm is as perfect as this one. 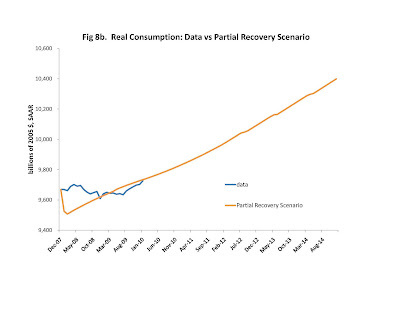 I made these forecasts last fall, and this week we had the release of another month of consumption data (Jan 2010) plus another month of labor data (Feb 2010). 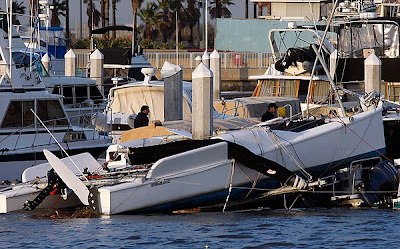 In January, Diane Sawyer (this is a video podcast -- go to the 14:10 mark) explained how a couple of Reynolds 33 catamarans were thrown 50 feet in the air by a tornado/water spout/high winds in Southern California. The one shown here was called "Supply and Demand." 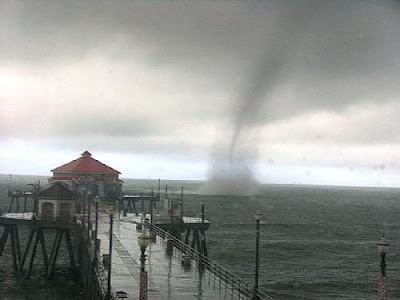 Fortunately, no one was on board, and no one (not even the Wicked Witch of the East) was underneath Supply and Demand when it came crashing down on the pier. It is in remarkably good shape considering it fell 50' and had its trampoline pierced by the 12' pylon shown in the photo. But people rely on supply and demand for their safety, and this boat had enough structural damage to be considered a total loss. Thankfully, designer Randy Reynolds says that Supply and Demand can be built again from the same specifications, and will continue to far outperform Keynesian, Marxist, Feminist, Austrian, and just about any other vessel, and do it with much greater efficiency. Boat US and the Seaworthy Insurance Company deserve special thanks for handling this freak accident so professionally, and promptly and cheerfully paying Supply and Demand's owner pursuant to its insurance contract! Randy Reynolds and Bob Long are not only great sailors and boat builders, but also engineered a quick recovery from the storm. Thanks also to the United States Coast Guard. What Does Aid to States Do To Marginal Tax Rates? Suppose that the federal government gives $ to the states in a way that give states incentives to match the federal spending with more of their own spending. Then the federal grant would increase state-level taxation (presumably some combination of present and future taxation), and thereby raise nationwide marginal tax rates beyond that occurring due to the fact that the federal government eventually has to pay for federal spending with federal taxes. And this does not even could "implicit" marginal tax rates created by any tendency of states to spend more on low income persons and businesses. If the federal government gives fungible $ to states, then the states could react either by cutting current state taxes (or increasing them less), cutting future state taxes (even states with balanced budget amendments could do this by adjusting their capital expenditures), or increasing spending. The Obama White House estimated that 1/3 of fungible federal $ to states goes to state tax cuts, and the other 2/3 to increased spending -- a pretty good estimate IMO. The tax cuts do not necessarily have to be in the present, and do not necessarily have to reduce marginal tax rates (e.g., some of the recent federal "tax cuts" increased income-weighted marginal tax rates). The increased spending itself is very likely to raise marginal tax rates. Thus, the effect of aid to states is probably a lot like the average federal stimulus dollar spent on other things, which raises marginal tax rates and thereby reduces GDP. Another part of the "Stimulus" law spends $21 billion increasing food stamp spending. It is well known that the food stamp program acts as an implicit tax on earning, because fewer food stamp benefits are awarded to people who earn more. In case you think that adding 20 percentage points to marginal tax rate would not reduce employment during a recession, take a look here. Does "Making Work Pay" Actually Make Work Pay, or Raise GDP? The "Stimulus" law's single most expensive provision was "Making Work Pay". It is a $400 tax credit to persons with ANNUAL earnings in between $6452 and $75000, and lesser amounts for persons earning outside the range (reaching zero at $0 and $95000). So this provision does encourage people to earn somewhere in between $6452 and $75000, rather than earning outside the range. In order to understand how that relates to "making work pay", we need to know whether it does more to pull incomes down into that range from above, as opposed to pushing them up from below. One question is how many people earn zero for the year, but are on the margin for working. This is difficult to know exactly but, for example, the 2009 CPS demographic supplement says that 10 percent of men aged 25-54 in 2008 earned zero that year. Only 3 percent of men and women aged 25-54 in the labor force (but not necessarily working) in March 2009 had zero earnings for 2008. So let's say that the number of persons who might consider changing their annual earnings from zero to a positive amount is equal to 5 percent of the labor force, or about 7.8 million people. Another 20.5 million people had earnings between 0 and $6452 for calendar 2008. So we have a total of about 28 million people encourage to work, or work more. 8.4 million people earned between $75K and $95K in calendar 2008. So clearly there are more people induced to earn more rather than less, and we can conclude that "making work pay" did push in the direction of raising the national employment rate (how much is a much more complicated question). Note that the types of people encouraged to work more are different than the types of people encourage to work less, so it is possible that "making work pay" could reduce GDP even while it raises national employment. The 8.4 million people earning $75K and $95K in calendar 2008 had an average income of $83K, as compared to $3K for those 20 million earning $1-6452 (who knows what the 7.8 million who earned zero would have earned if they had worked). Obviously, $400 seems like more to the latter group, and therefore would tend to motivate a greater change in hours or weeks worked for them: a rough adjustment for this compares the marginal tax rates for the two groups. The former group's marginal tax rate was 2% (ie, they lost $20 of tax credit for every $1000 they earned), and the latter group's was -6.2% (they gained 62 dollars of credit for every $1000 they earned). So the income-weighted average marginal tax rate for the two groups was (8.4*83*.02 - 28*3*.062)/(8.4*83+28*3)= +1.1 percent. In other words, on net Making Work Pay probably REDUCED the supply of income, because its income-weighted average marginal tax rate was positive, rather than negative. In summary, a good guess says that "Making Work Pay" may have increased national employment and hours, but it is highly unlikely that it increased GDP. The Treasury cost of the program was not only the $116 billion budgeted, but also the loss of other tax revenues due to the net disincentive to earn. I have written before about how federal mortgage modification guidelines discourage homeowners from earning too much. One instance of this would be a underwater homeowner who turns down (or fails to search for) a higher paying job in regions that are outside of the commuting distance from his house. Let's suppose that one of those regions offers a job pays well enough to justify the costs of moving. Absent an underwater mortgage, such a homeowner would take the job, sell his house, take his equity to his new region, and purchase a house there. When underwater, but absent modification, he might still make the same choice, but would have to consider the extra cost of either (a) defaulting on or short-selling his mortgage (this would be the cost of having a lower credit score, or perhaps moral qualms with failing to pay) or (b) raising the funds to pay off his negative equity. Absent mortgage modification, turning down the job will not make his negative equity go away. In fact, to the degree that he considers default/short-sale and his home equity is uncertain, taking that job and moving would allow him to exercise his home-value-put option while it is still in the money. In other words, persons in this situation might be too quick to move (that's the foreclosure problem). But mortgage modification changes the story: now turning down the job and staying in the house might make the negative equity go away, because persons are eligible for federal mortgage modification only if they remain in the underwater house. So when I say that "mortgage modification discourages people from earning too much" that does not only mean quitting one's job to "game" the mortgage modification formula, but also failing to increase one's income or take an new job when the opportunities arise. One of the great advances of 20th century was increased life expectancy. This advance might have bankrupted Social Security, if it were not for women in the work force. When the Social Security program was created in the 1930s, life expectancy was 60 years, as compared to 75 years in the 1980s and 78 years today. With 1930s life expectancy, a great number of people were expected to pay Social Security taxes while they worked, but never live long enough to ever collect benefits. The early planners of the system understood that the prior contributions of the now-deceased were one way that a retiree could collect more in benefits than he paid in taxes. Although there are still some Americans who work, pay taxes, and then die before collecting Social Security benefits, this life cycle is much less common than it used to be. Thus you would think that Social Security would have had a huge deficit years ago. Social Security’s architects did not anticipate another major advance in the 20th century: women’s progress in market work, and how that progress would fill Social Security’s coffers. Once they turn 62 years old, married people, widows and widowers are eligible for Social Security, regardless of whether they ever worked for pay during their lifetimes. When Social Security was in the planning stages, it was expected that most working-age couples would have only one person working (and thereby paying the payroll tax) — typically the husband. Yet when these couples retired, Social Security would pay benefit checks to both of them as long as they lived (see the chapter in this book written by Professors Jeffrey Miron and David Weil, for more on the economic and demographic projections originally used to design Social Security). Thus, a payroll tax rate was planned that could bring in enough revenue from working men to pay both the retired men and the retired women. History did not quite turn out that way. In fact, millions of married women worked for pay and paid the payroll taxes as they did. This was largely profit for the Social Security system, because the system would have paid those women benefits regardless. The revenues of governments in the future will depend just as much on how women spend their time. Governments can expect more revenue if women continue significantly with their labor market progress, and less revenue if some of women’s payroll gains are reversed in the years ahead. The law gives the most per capita to states with the least unemployment. Read more here. added: The White House appears to read economix, and yesterday offered a rebuttal of Professor Glaeser's critique. Forget a Second Stimulus. Stop the First One! Obviously, they agree with "Who's Afraid of the Big Bad Deficit?" and "More Government Debt, Please." In case you are wondering where else the CBO went wrong, look here. In short, they completely ignore incentives even while a long economics literature has shown that they have real effects, even in recessions. The CBO has a report on the effects of the "stimulus" law. To its credit, it does attempt to address some of those who say that the "stimulus" law did not stimulate (see its appendix). However, it does not address the single biggest criticism I have made on this blog, on TV, and elsewhere: that much of the stimulus spending (and many of the so-called tax cuts) goes only to persons and businesses in financial hardship, and thereby serves as a tax on success. In other words, stimulus spending is an implicit income tax, and thereby reduces national income rather than increasing it. Implicit taxes have been familiar to economists for decades, and are widely acknowledged to be a big part of the economics of pensions, unemployment insurance, welfare, and other programs: the CBO and so many other economists have no excuse for ignoring them. The CBO claims to be critical of general equilibrium models (although it approvingly cites a bunch New Keynesian general equilibrium models), but the problem with implicit taxes has nothing to do with general equilibrium reasoning. The CBO also offers some critiques of "rational models", although the problem with implicit taxes has nothing to do with rationality, either.